The U.S. Green Building Council has awarded D.C. with the highest certification they give, the LEED for Cities Platinum certification. WASHINGTON — D.C. already leads the nation for environmentally friendly green building construction per capita, and now it gets the highest citywide award for green building. 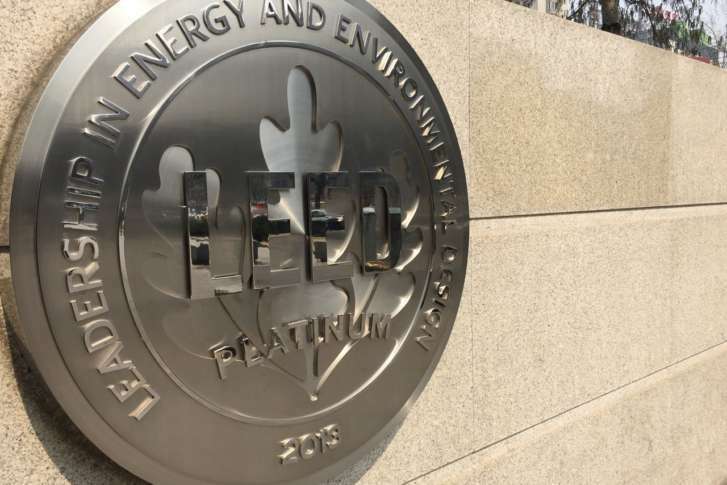 The U.S. Green Building Council has named the D.C. as the first city in the world to receive the Leadership in Energy and Environmental Design (LEED) for Cities Platinum award, the highest certification given by the U.S. Green Building Council. The LEED program measures the District’s sustainability across an array of metrics, including energy, water, waste and transportation. It also factored in education, prosperity, equity, health and safety. The city’s Sustainable DC Plan, a vision for sustainable initiatives in D.C., has a stated goal of making the District the healthiest, greenest and most livable city in the U.S. by 2032. Mayor Muriel Bowser’s office touts achievements since its launch that include 58 percent of D.C. commuter trips are by biking, walking or taking public transportation. It says greenhouse gas emissions in the city have been reduced by 24 percent. In 2015, D.C. signed a power purchase agreement with Nextility Inc. to boost the city’s solar generation capacity by 70 percent through the deployment of 11.4 megawatts of solar systems on roofs and parking lots at 34 city-owned facilities. It is one of the largest municipal on-site solar projects in the nation. That same year, D.C. leaders signed a 20-year power purchase agreement with Iberdrola Renewables LLC to supply 35 percent of the city’s government’s electricity with wind power, the largest wind power deal of its kind by a U.S. city. Under that agreement, D.C.’s Department of General Services is purchasing the output of Iberdrola’s South Chestnut wind farm in southwestern Pennsylvania. If D.C. were ranked as a state, it would be the greenest building state in the nation, with 19.3 square feet of LEED-certified construction per capita. D.C. is also near the top, ranked just by raw square footage, according to the Green Building Council’s 2016 list of top states for LEED Green Building.